Below are a number of frequently asked questions. If your question is not addressed below, please contact us for more information. How much does a trip cost? What are your rates during peak season? Where is Alaska’s Boardwalk Lodge? What weather conditions can we expect? What’s the time zone and when is sunrise and sunset? What are check-in and check-out times at Alaska’s Boardwalk Lodge? Can I bring my own fishing gear and tackle? How do we get to freshwater lakes and streams? What kinds of fishing boats are available? How long can I fish with a Guide or Captain each day? How do I obtain an Alaska fishing license? How is my fish handled? Boardwalk Lodge is located on Prince of Wales Island in Southeast Alaska – a short 33-minute floatplane ride west of Ketchikan. It is positioned on the North East corner of the island, facing Alaska’s famous Inside Passage. Current season rates are published on our Lodge Rates page, including peak season and reduced pricing for shoulder season packages. Published group and child rate discounts may be announced, as well as allowances for non-fishing guests. Guests traveling from “the lower 48” fly to Seattle’s SeaTac airport, take a 90-minute Alaska Airlines flight to Ketchikan, then a breathtakingly beautiful 33-minute float plane from Ketchikan to the dock at Boardwalk Lodge. Ferry service is also available between Ketchikan and Hollis and guests can arrange to have a lodge staff member meet them at the dock in Hollis. Private and corporate aircraft can fly into Klawock (45 min. drive) and tie downs are available free of charge. Call ahead and we’ll be there when you land. The climate on Prince of Wales Island is that of high latitude rainforest. Weather conditions change frequently and often without warning, especially during spring and fall months. Temperatures in spring and fall range from 35-65 degrees, while summer temperatures range from 45-75 degrees. Weather is generally comparable to that of Seattle. Water conditions on the Inside Passage, where Boardwalk Lodge is located, are much less windy than elsewhere and “glass” or “oily” calm water is not uncommon. Get current Southeast Alaska weather information. You need to arrange your transportation to arrive at the lodge by 6 PM. Your flight to Ketchikan must arrive prior to 5 PM. Check-out time is 10 AM on the day of departure (all times are local). This will enable you to catch a 12 PM or later Alaska Airlines flight from Ketchikan. Depending on occupancy, it may be possible to accommodate early check-in or late check-out to allow for additional fishing opportunities, beyond your booked reservations. Fishing rates outside your normal stay are as follows: half-day (fewer than four hours) is $400/person; full-day (up to 10 hours) is $800/person. Be sure to let the reservationist know of any special needs when booking, so that appropriate arrangements can be made for your party. Bring comfortable, casual clothing appropriate for temperatures ranging from 45-75 degrees. Layered clothing is recommended so you can adjust to changing conditions. Wool and synthetic insulating materials are excellent, and we recommend layers of differing materials, (e.g., cotton for comfort, and wool or fleece on top for warmth). Consider bringing a small backpack or dry bag that you can take on the boat to store personal items and extra layers. Dress for dinner is casual. While stories about the size and aggressiveness of mosquitoes in Alaska are plentiful, the reality here is much different. Depending on the season and weather and wind conditions, guests can expect little more than a mild threat from airborne pests. Boardwalk Lodge staff work hard to control mosquito and No-See-Um populations around the lodge, and DEET based repellent and protective netting are available for your comfort. Boardwalk Lodge is noted for its superior quality equipment and provides all the rods, reels, waders, and protective gear you will need for a successful fishing experience. Top-of-the line Orvis gear is available for fly fishing, while Lamiglas rods and Okuma reels are used for spin casting and saltwater fishing. Felt bottom boots for freshwater anglers are banned by the Alaska Department of Fish and Game to prevent invasive species. Additional weight due to personal gear may limit the amount of fish that you are able to fly out. See additional information on recommended gear for both freshwater spin casting and fly fishing. Boardwalk Lodge is unique among Alaska’s fishing lodges in that it is close to both fresh and saltwater fishing. This makes costly and time consuming fly-outs unnecessary, though they are available if you prefer. The lodge boasts 23 fishable lakes, streams, and rivers within a short, scenic drive, and a fleet of Suburbans to get you to the fish quickly, comfortably, and safely. Only the best! Each of our new or nearly new 26 foot V-Hull Cuddy style boats has a heated cabin with sanitary facilities, GPS navigation, fish finders and radio communication equipment onboard. Just 4 guests to a vessel. These boats are particularly well suited for Alaska fishing, water and weather conditions. Boat captains are all coast guard certified and trained in CPR and first aid. Captains and guides are scheduled for nine hours fishing time each day, from 7 a.m. to 4 p.m. Additional hours may be arranged with the lodge manager at his discretion for a moderate per-hour cost. Once flight arrangements have been made and confirmed, we will send you a link to essential online forms to fill out (hard copy forms available upon request). Simply complete the forms and click submit. Your fishing license will be waiting at the lodge when you arrive. If for some reason you are unable to complete the forms, you will be able to do so after you arrive. 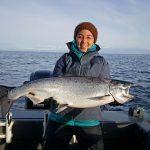 Cost for the Alaska fishing license is included in your package. As soon as your catch is aboard, it is placed in the boat’s icebox for safekeeping. At the end of the day, (while you relax and prepare for hors d’oeuvres and dinner), your catch is taken to a prep area where the fish is cleaned, filleted or cut into steaks, portioned, vacuum packed, labeled, quick frozen, and packaged into 50 lb. boxes for easy transport. Boxes of fish will remain frozen for 48 hours outside of a freezer. Guests whose return trips last longer than that can rent freezer lockers in Ketchikan and Seattle airports. In addition, most hotels en route are accustomed to handling frozen “luggage” for their guests. If you prefer, frozen fish can be shipped via FedEx every Tuesday and Thursday. Normal shipping charges apply. Boardwalk Lodge is an ideal place for great family vacations. Children 10 years and older can accompany their parents on fishing boats. Day care or babysitting service is not available so please don’t bring younger children along without someone to care for them during the day. Do you offer beverage service? Boat coolers are stocked with your choice of soft drinks, bottled water and popular beer brands. House wine and beer are available free of charge, while you enjoy a delicious assortment of appetizers and hors d’oeuvres. We stock an assortment of other alcoholic beverages for purchase. Premium wines by the glass and mixed drinks are available for a nominal fee.